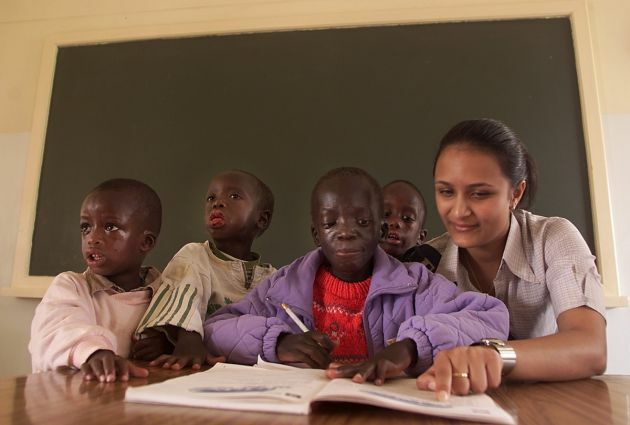 (Photo: Reuters / George Mulala)Beauty queen Miss India, Hiral Shah, helps AIDS orphans to read during a courtesy call at Cattolonge, an Italian-run orphanage on the outskirts of Nairobi January 15, 2002. More than 500 Kenyans die from AIDS each day, according to the health ministry. The government is trying to encourage the use of condoms to stop the spread of HIV/AIDS, but says its efforts are being hindered by ignorance and church groups which condemn the use of contraceptives. HIV/AIDS, he said, "cannot be overcome by the distribution of condoms." The outcry was immediate and Benedict, a year later, softened his stance, telling German journalist, Peter Seewald, condoms could be a "first step" toward moral responsibility when used to prevent sexually transmitted infections rather than pregnancy. Now a similar message is being promoted in Kenya. 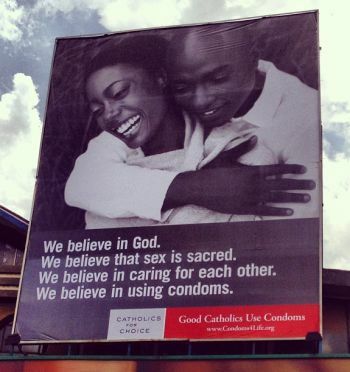 In April, the U.S.-based Catholics for Choice brought its Condoms4Life campaign to Kenya, placing newspaper ads and buying a billboard in the capital city of Nairobi that state, "Good Catholics Use Condoms." Condoms4Life is Catholics for Choice's 12-year-old project to counter anti-condom lobbying in Africa, Asia, Europe and the Americas. In Kenya, Condoms4Life is a direct response to the Kenyan Catholic bishops' conference getting a pro-condom, HIV-prevention television ad pulled off the air in March. In the ad, a woman having an extra-marital affair is advised to use a condom to prevent the spread of disease. "The campaign is vital because the bishops' recent activities are not representative of Catholic teachings or beliefs," said Jon O'Brien, president of Catholics for Choice, in a press release. "Catholics do support the use of condoms, and they do use them to protect themselves and their partners." In an interview with the BBC after the controversial television ad was pulled, Dr. Peter Cherutich, deputy director of Kenya's National AIDS and STI Control Program, said the government produced it because a large number (between 20 and 30 percent) of married Kenyans have sexual relationships outside of their marriages – and that most of them do not use condoms. HIV is prevalent in Kenya, with 1.6 million Kenyans testing HIV-positive – more than 3 percent of the country's population. "The aim of the campaign," said O'Brien, "is to ensure that Catholics know that despite what the bishops say, Catholics can in good conscience use condoms. Catholics in Kenya are no different. They can take the steps to protect themselves and their partners against HIV." Kenya's bishops have voiced their opposition the Condoms4Life ads as well, and have asked for them to be removed. "Catholics for Choice are not Catholics in the sense of the one, holy, catholic and apostolic church," Cardinal John Njue, archbishop of Nairobi, told Vatican Radio last week. "We want those adverts pulled out."